Phnom Penh- the Meeting point of Three Rivers. Phnom Penh is the capital of Cambodia. It is located where the mighty Mekong river, Basaac and the great Tonle Sap river meet. 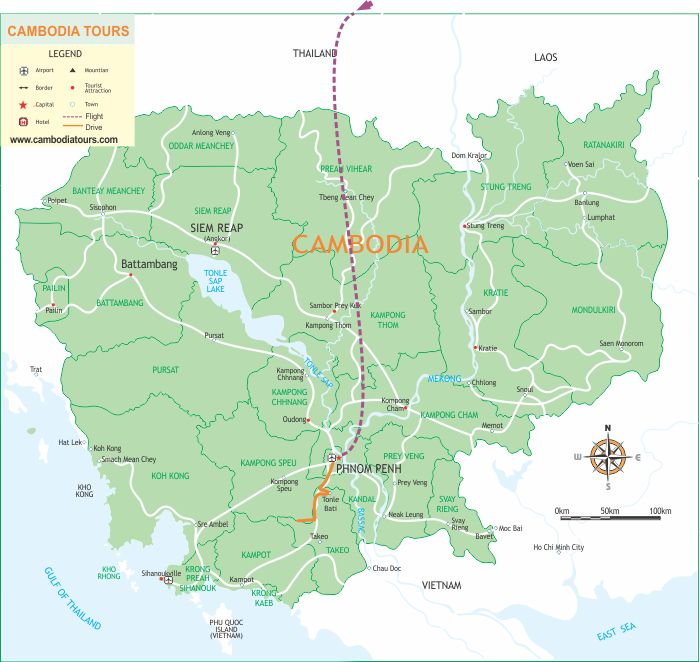 4 Day package of Cambodia Tours bring you to back roads and invite you to discover this capital city in depth. Please contact our Travel Consultant for more details and the best offer. Price from: $246 - Book now! Welcome to Phnom Penh, Cambodia’s vibrant and bustling capital city. Despite its recent turbulent history, Phnom Penh’s wide tree-lined boulevards and faded colonial mansions hold an undeniable charm. Upon arrival, your tour guide will meet you at the airport and take you to your hotel for check-in. Enjoy lunch at a local restaurant then set out on a city tour to acquaint yourself with Phnom Penh’s major sites. Your visit today includes National Museum, an excellent introduction of the ancient Khmer art and civilization, and the Royal Palace, home to the royal family and the opulent silver pagoda. Transfer back to the hotel and spend the rest of day at leisure. Breakfast at hotel followed by a boat transfer to Mekong Islands for a village trip. Located 20 km north of Phnom Penh, Koh Dach silk village is where you will take a soft biking along while meeting with the local Khmer and studying how they farm and produce silk to live. After lunch (on your own budget), transfer back to Phnompenh to continue learning about the Cambodia’s recent history on a guided tour of the Tuol Sleng Genocide Museum and the notorious Choeung Ek “Killing Fields”. After breakfast at the hotel, you will travel by private vehicle to Phnom Tamao Wildlife Rescue Centre, located an hour’s drive from Phnom Penh. It is the world’s largest sanctuary for sun bears and has educated hundreds of thousands of Cambodians about the threats facing their wild bear populations. At this zoo, you will learn about the 100+ rescued bears living here. Twenty-one forested enclosures have been built over 7 hectares to house a mixture of Sun bears and Asiatic black bears of different ages and personalities. After visiting the various bear houses, take part in a fun activity of preparing enrichment toys. You also have chance to visit some of the other endangered species kept at Phnom Tamao. Leaving Phnom Tamao, drive to visit Tonle Bati Temple, an Angkorian-style temple which remains largely intact. Whilst being very small in size, the temple is one of the best preserved and most picturesque in Cambodia. On the way back to the hotel, stop at the Russian Market. (Note: please note that the bears are rescued wild animals so direct contact is not possible under any circumstances. You are recommended to bring closed footwear, sunscreen and suitable clothing for a day in the forest). Have breakfast in your hotel and relax until the transfer to the Phnom Penh airport for your departure flight home.